The Leviton Renu USB Charger/Tamper-Resistant Duplex Receptacle/Outlet offers two high-powered USB Ports with 3.6A of charging power and two 15A or 20A/125V Tamper-Resistant Receptacles. It has the capability to charge two USB powered electronic devices utilizing its two USB Ports, leaving the two Tamper-Resistant Receptacles free for other uses. The Leviton USB Charger/Tamper-Resistant Duplex Receptacle/Outlet is designed to charge tablets, smart and mobile phones, gaming devices, digital cameras and a host of other electronic devices. Part of the Renu collection of decorative devices, it is available in 20 popular colors and features a face that can be snapped off and on easily to update the color and create a new look at any time without any rewiring. The Renu line of decorative electrical products includes switches, outlets, GFCIs, dimmers, and sleek, screwless wallplates (sold separately). Decora Duplex Receptacles are designed for a chic appearance, quick installation and durability. The impact-resistant thermoplastic design allows for a long service life and high performance in homes, offices, schools and other settings. SmartlockPro Slim GFCI Receptacles install easily. With industry-leading quality, professional grade lockout action, and the slimmest profile on the market, this GFCI receptacle is the smartest choice in ground fault circuit interrupter protection. 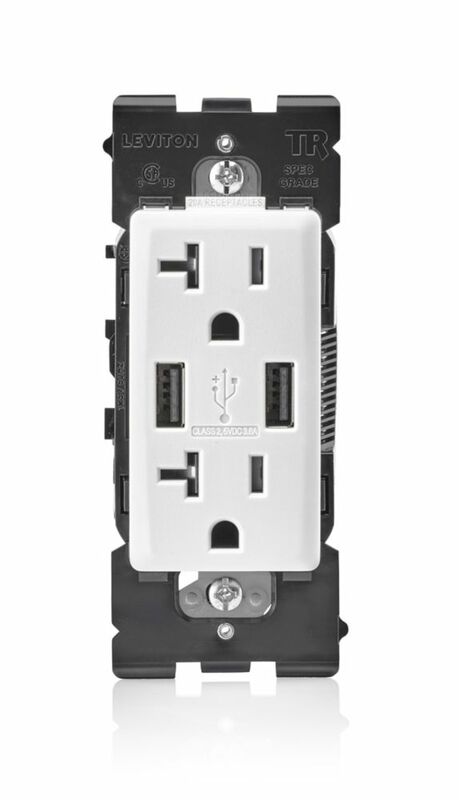 3.6A USB Charger 20A Receptacle (Wallplate not Included) in White The Leviton Renu USB Charger/Tamper-Resistant Duplex Receptacle/Outlet offers two high-powered USB Ports with 3.6A of charging power and two 15A or 20A/125V Tamper-Resistant Receptacles. It has the capability to charge two USB powered electronic devices utilizing its two USB Ports, leaving the two Tamper-Resistant Receptacles free for other uses. The Leviton USB Charger/Tamper-Resistant Duplex Receptacle/Outlet is designed to charge tablets, smart and mobile phones, gaming devices, digital cameras and a host of other electronic devices. Part of the Renu collection of decorative devices, it is available in 20 popular colors and features a face that can be snapped off and on easily to update the color and create a new look at any time without any rewiring. The Renu line of decorative electrical products includes switches, outlets, GFCIs, dimmers, and sleek, screwless wallplates (sold separately).